After years of continuous and draconian cuts that have even deprived it of its aircraft carriers, the famous British navy is slowly returning to the global scene, intent on affirming the role of global power of a Great Britain now in an identity crisis. Internally divided by multiple nationalisms (Scottish, Irish, Welsh and now even English) and screwed into a political crisis with the European Union, London seems to rediscover in the use of force and in particular in its navy a valid instrument to reaffirm the own presence on the global scene. 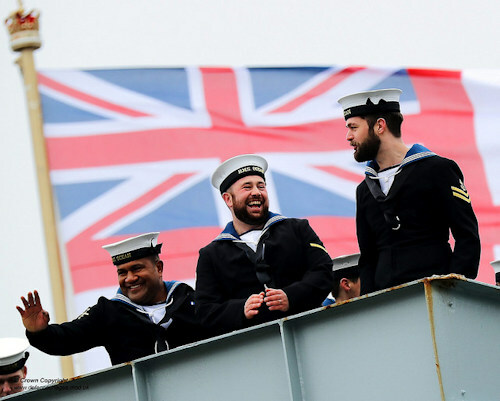 The Royal Navy, in fact, given the insular nature of Great Britain, is not only the ultimate guarantor of national defense and of the commercial traffic from which London depends for its survival and prosperity, but it is also an excellent projection of hard e soft power. Tasks that his majesty vessels have always performed with great effectiveness over the centuries, and that now with the slow but inexorable return of Russia and China to the chessboard of the great powers are even more compelling. 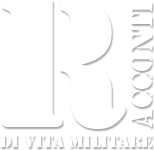 In more strictly military terms, the "revival" of the Royal Navy, partly accompanied also by that of aeronautics and the army although to a more modest and less visible extent, consists mainly of the return of the aircraft carrier between the units in service; from the creation of new overseas bases capable of logistically supporting military operations in territories far from the motherland, and from a greater presence in the Far East. All aimed at a recovery of strength projection capabilities as well as the reaffirmation of Great Britain as a great world power. As regards the return of the two aircraft carriers, this is not a novelty or a consequence of the changed geopolitical scenario. Their commissioner goes back to the 20071 and represents the natural process of replacing HMS class aircraft carriers Invincible (those that fought in the Falklands War) with more modern units and responding to the new British military needs. However, the economic crisis of the 2008, in addition to having extended the construction time and having questioned the purchase of the second ship for a certain period, forced the then government of David Cameron to divest the only two in advance in the 2011 aircraft carrier then in service. Shortage partly supplemented by HMS helicopter carriers Illustrious up to 2014 and HMS Ocean up to the 2018, but which nevertheless strongly undermined its ability to launch complex military missions abroad for about 10 years. 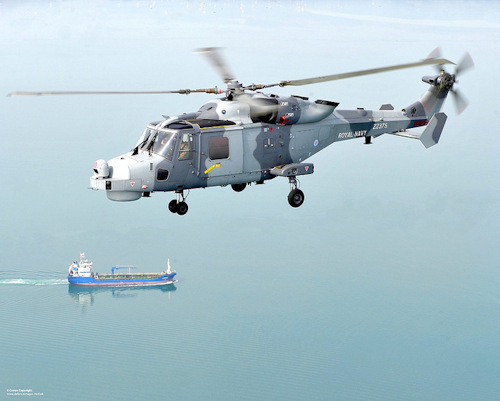 At least until the 2020-21 and the 2023 when the two HMS carriers Queen Elizabeth and HMS Prince of Wales, once the trial periods are over, they will enter service with a limited component of helicopters and F-35 fighter planes. However, at least the 2025-26 will have to be waited to see the total number embarked2. With a net tonnage of 65.000 tons and the capacity to host up to 40 F-35 aircraft and over a thousand men, the two aircraft carriers are the largest units ever built for the Royal Navy, as well as second largest globally after the US and with more or not the same tonnage of the first aircraft carrier recently built in China, the Type 001A. 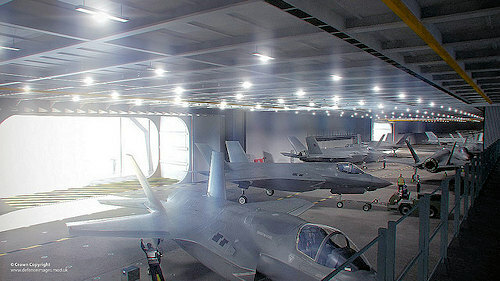 In operational terms, through the air component embarked, the two aircraft carriers will allow the United Kingdom to launch complex military actions with high fighting intensity in operational theaters, even very far from the national territory, practically acting as gigantic floating air bases. 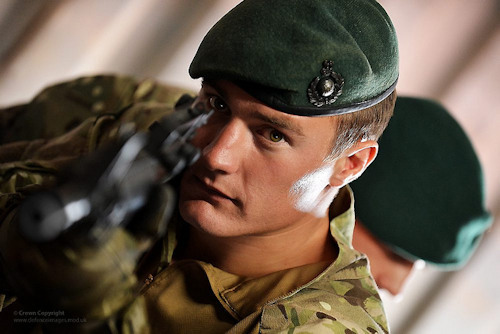 They will also be able to carry out a myriad of other missions, such as support for amphibious operations by boarding helicopter and Royal Marines squadrons, and rescue operations in humanitarian and climatic crises. However, also in the light of modern ani-ship systems that limit its war potential, such as the much feared Russian missiles Kalibir, their real power lies in the symbolic status. The aircraft carriers are in fact the prerogative of the great powers, as few nations can afford the necessary funds for the construction and maintenance of these sea giants; as well as the engineering and maritime capabilities to be able to effectively develop and use them in complex operational scenarios, in concert with allies and other war units. They are the most effective "ambassadors" for any nation as they symbolize their ambitions and power. As stated by the admiral of the Royal Navy Mark Stanhope, "Nations that aspire to a strategic international influence possess aircraft carriers"3. In this way Great Britain is strongly positioned among the great world powers, already strengthened by a maritime and military history which give it substance and legend. Even more important is the expansion of British military installations for the globe in support of the navy, disused during the last decades in conjunction with the decline of British international power, and therefore also of naval power. However, with Brexit, the slow return to a more unstable multipolar and geopolitical world, and to the greater importance of the Asian continent in economic and strategic terms, London seems to rediscover its global ambitions, as well as the need to have a large network global bases so as to better defend their own interests and the partially built international order (minority partner of the United States) and from which it has greatly benefited. The most significant opening was probably that concerning the HMS base Juffair in Bahrain in the 2018, thus representing for the first time since the 1971 the return of a permanent installation east of the Suez Canal. Decisive and further strengthened by an agreement signed between the British government and that of Oman, which guarantees the Royal Navy access to the port of Duqm in the Arabian Sea4. Equally important and not without a certain amount of surprise from analysts on the subject, Defense Minister Gavin Williamson's announcement in December of the 2018 to open new military bases in the Caribbean and Pacific Ocean, probably in Brunei or Singapore, where a jungle training camp is already present for the British army and a small fueling station for the navy (Sembawang) respectively. In addition to other overseas bases, the Royal Navy would thus reach a strategic depth and operational capabilities that few other nations possess, thus allowing it to exert influence in major operating theaters around the world. Tactical necessity even more urgent in the British case, given the absence of nuclear aircraft carriers and therefore the need for support bases in the event of missions in territories far from national borders. To give substance to this military strengthening there is also an increase in activities in the Asian seas, exemplified by both a record presence of warships and the consolidation of old military alliances now in decline. Beyond the traditional importance of the Perisco Gulf for energy reasons, the growth of China and India and the difficult situation with North Korea are in fact making the Indo-Pacific the center of gravity of the world economy and geopolitics. Reason for which the United States launched the very famous "pivot to Asia" during the Obama administration, which although to a lesser extent, also the United Kingdom is trying to adopt. Especially with the imminent and chaotic divorce from the EU and the consequent loss of political influence (at least the one that is defined in the jargon of international relations)low politics", Mainly concerning business of an economic and diplomatic nature, as opposed to"high politics"More directly associated with the military-conflict dimension). The 2018 in particular was exceptionally significant from the point of view of the British pivot to Asia, as three warships were sent to the region, constituting the largest deployment since the Korean War in the 19505. In addition to a series of joint exercises and missions aimed at strengthening its old network of alliances in the Far East, in particular with Japan (the main Asian maritime power together with China) and with the members of the "Five Power Defense Arrangements", Malasya, Singapore, Australia and New Zealand, the main objectives of the Royal Navy concerned the application of international sanctions to North Korea and the deployment of the HMS warship Albion in the vicinity of the Paracelso islands (controlled by China but also claimed by Vietnam and Taiwan) in the South China Sea. Thus attracting the ire of China that accuses London of having entered its national territory without permission, while the British claim to have acted in compliance with international laws. It is without a doubt a strong and courageous position taken by London against Beijing and that puts it in this way as one of the United States' "junior partners" in China's containment policy. Position further strengthened by a series of recent joint exercises with the US navy in the South China Sea, and by the announcement by the defense minister of a possible deployment of the HMS aircraft carrier Queen Elizabeth in the same sea, in an operationfreedom of navigation”(FON). Announcement that led to the cancellation of a planned meeting of the Minister of Economy in China, with its national debate on the necessity and usefulness of this deployment, called by the Financial Times "gunboat diplomacy", in memory of the aggressive foreign policy of the British Empire. However, to this greater assertiveness and military initiative, there are numerous problems that could invalidate its ambitious plans. The main criticism concerns the low number of warships available with respect to the declared strategic objectives. In particular the deployment in the Asian seas and the introduction of the two aircraft carriers require, according to many analysts including myself, a greater number of naval units to have a really significant impact. The risk otherwise is that of operating marginally without having a decisive influence, obscured by the powerful military navies of the United States, China, Japan, Korea, India and Iran, able above all for geographical and demographic reasons to deploy a greater number of ships and planes in the region. To further complicate the picture, the presence of the two aircraft carriers is paradoxically. In fact, in cases of high risk missions they cannot operate on their own but require an entire fleet of ships capable of providing air, underwater and logistical support of various types. At least two frigates, two destroyers, a submarine and a supply vessel for each carrier would be required. Out of a total of six destroyers, thirteen frigates and seven nuclear-powered submarines currently supplied to the Royal Navy, and considering that there is always some units in port for maintenance work, it is easy to notice that formed the battle groups, there few ships would remain available for other missions or to replace any losses. Especially considering the commitments made by London to operate in all the major seas and oceans of the world, from the South Atlantic to the North Atlantic, and from the Mediterranean to the Persian Gulf, finally reaching the Indo-Pacific. An "expansive strategy" that in the Second World War, and not only, proved to be bankrupt due to the difficulties of operating in multiple operational scenarios at the same time and the disastrous losses suffered by the Japanese navy (in this case the underestimation also played a decisive factor the effectiveness of the air forces in the naval clashes as well as of the Japanese power), despite the greater number of units available compared to the present. 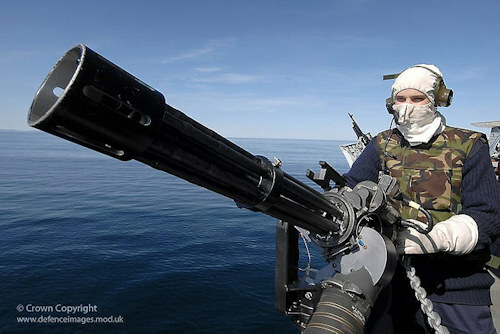 The Royal Navy fleet is simply too small compared to the ambitious global targets set and the potential "enemy" navies of Iran, North Korea and especially China and Russia, with which there are the greatest chances of coming into conflict. 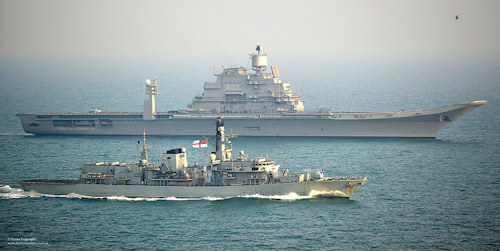 These in fact not only possess a greater number of warships, although in many cases lower than the British ones in terms of size and operational capacity, but they are also investing large sums of money in the development of technologically equivalent war systems to those in the West if not superior. Beyond the powerful anti-ship missiles, like the one already mentioned Kalibir or the Chinese CM-401, considered able to take out units like the aircraft carriers, Russia has invested in a particular way on the application of the AD / A2 defense concept (Anti Access / Denial Area), based mainly on the anti-aircraft batteries S-300 and S-400, and designed to prevent access to the airspace even to the most modern western military technology aircraft stealth. 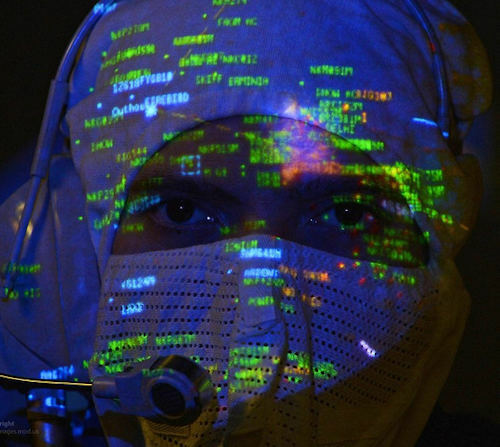 However, net of the countless debates on the respective technical and tactical military capabilities to be employed - for example, to counter Russian missile systems, beyond cybernetics and electronic warfare, more and more often we speak of drone swarms that if launched would have the goal of disabling essential equipment such as radars or the same anti-aircraft missile batteries - in the absence of empirical evidence it is difficult to determine who would win in a hypothetical military confrontation. In fact, both sides tend, as is natural, to exaggerate the war potential of their weapon systems. The experience and quality of sailors, difficult to measure but of which the British are certainly not lacking, should also be considered. So a picture with so many lights and shadows, and made even more complex by the uncertainties linked to Brexit and the United Kingdom's holding in terms of national unity. In any case, the greater role of the Royal Navy in the revival of British power is evident, even if its limits are not as clear. In the writer's opinion, London certainly has the capacity to operate a navy worldwide, but to do so would need to increase the defense budget to at least 3% of GDP (like the United States and Russia, on the other hand); work jointly with the Allied navies and limit their range of action based on their own means and national interests, remembering that the times of the British empire are over and that in any case even during that period success was not guaranteed, as demonstrated by the many defeats, especially during the Second World War. Of these three points, only the second appears to be really taken into consideration with the inclusion of British units in French naval groups and vice versa, in line with the Lancaster Treaty of 2010 between the two nations6. There are also similar collaborations with the Dutch navy and of course the US, thus making it an increasingly international military force integrated with the systems of some allied countries, but at the same time endowed with a valuable ability to conduct autonomous and complex missions in operational theaters very far from the mother country. Certainly a shadow of the Royal Navy of the eighteenth and nineteenth centuries, but nevertheless one of the most powerful military marines in the world, an essential cog in NATO, an irreplaceable partner of the United States, and the maximum expression of the will and power of the United Kingdom.